Catch-up on the Nigerian players that registered their names on the score-sheet in league matches across Europe on Sunday, March 17. 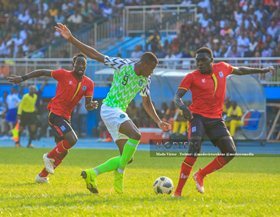 2015 U17 World Cup-winning striker Victor Osimhen displayed his finishing ability in front of goal by scoring in the 44th minute as Sporting Charleroi suffered a 2-1 loss at the hands of Eupen at Stade du Pays de Charleroi. Osimhen powered home a header to equalise for the home team after a free-kick was floated into the box. In the Danish Superliga, Frank Onyeka scored the game-winning goal to help Midtjylland register a 2-1 win against SønderjyskE, his sixth strike in the league since his debut in February 2018. Kurzawa equalised for the home team in the 24th minute, assisted by Onyeka, before the Nigerian midfielder netted the winner just before the hour mark. Elsewhere, Peter Olayinka blasted a shot from inside the box to open the scoring after 3 minutes as Slavia Prague beat Pribram 2-0 on game week 25 in the Czech Liga.